Boxcutters, Teaspoons, Jigger, Mixing-glass, Stirrer (long Spoon), Rocks Glass, Cup. 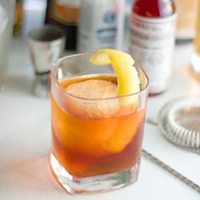 Stir the Whiskey, Cognac, Vermouth, Benedictine and Bitters in a stirring glass with 2 cups of ice, until cold. Strain into a Rocks Glass (with rocks, preferably one large one) and garnish with a Lemon Twist.